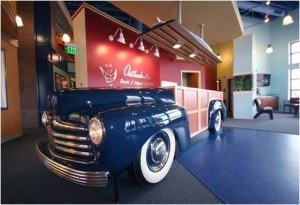 Appealing to kids and car enthusiasts, Dr. Dave Myers’ hot rod orthodontic office in Conway, AR, is designed to feel anything but usual. The whole space is transformed to a 50’s era theme, from the walls and the floor to the memorabilia that makes patients excited to visit. And helping to make sure it all runs smoothly? NEC’s UNIVERGE SV8100 server, which helps streamline communication and keep up with Dr. Dave’s growing business. Check out some of the pictures online to see for yourself. Doesn’t it make you want to go visit Dr. Dave?